After studying engraving, stone-carving, drawing and sculpture at the prestigious Paris Art School, the Ecole Nationale Supérieure des Beaux-Arts, where she graduated in 1981, Elisabeth Cibot excels in all four disciplines. Drawings, prints, screens in worked glass as well as bronze sculptures and fountains bear witness to her creative diversity and talent. For the past fifteen years or so, bronze has been the principal vector for her artistic inspiration. However, admirable preparatory sketches in red chalk also punctuate these years, contributing to a body of work in which acute observation and absolute mastery of the sensitive line are manifest. During this same period, several monumental works such as the statue of Captain Nemo and his creator, Jules Verne, for the city of Nantes and an strikingly life-like General de Gaulle in Drancy, near Paris, demonstrate Elisabeth Cibot’s extraordinary ability to stretch the boundaries her ideas and express them in every possible fine art form. A creative spirit, overflowing with inspiration, energy and grace, Elisabeth Cibot is now producing large charcoal studies drawn with searingly true strokes and washes whose contours are as expressive as her sculptures. Men, women, couples are the constant subjects of Elisabeth Cibot’s soul-searching. Through these couples, whose varying states of carnal fusion or abandonment seem close to despair, – as if their sensuality were a source of heartbreak, – transpires the artist’s distress at the lack of understanding between beings. She wears her technical virtuosity like a mask but it is easy is detect her constant quest for impossible harmony and her lucidity which refuses to hide behind representations of illusory fulfilment. 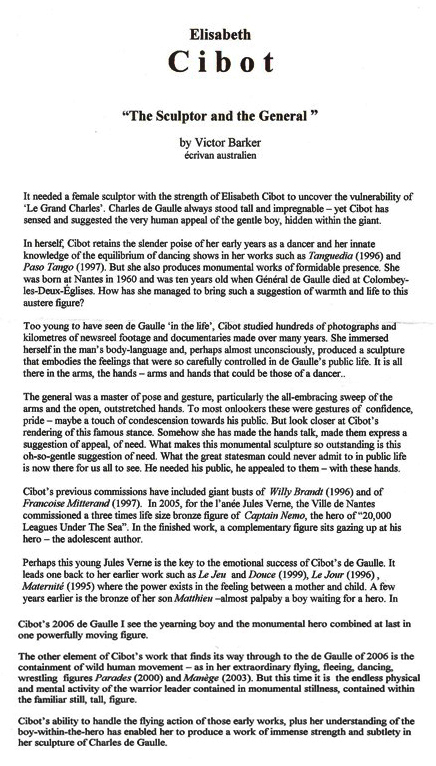 Profoundly humane, her virtuosity feeding on the tragic vanity of Man’s existence, Elisabeth Cibot is a truly great artist.